Could you do one of these assignments first, so we can see what it is you’re looking for? To refresh myself ourselves, the individual piece of the Epistemology study will be to create a personal epistemological proposition: to state and explain something about what we know, and how we know it. Can I do this first so I the class can see what it is I’m looking for? Um… yeah, sure. Of course. This started out as a messy, painful process for me that I trust will emanate throughout the class this week. But this sort of psychic discomfort is integral to the learning process, I’ve come to think; and it is something that I was curious to lean into with the hope of seeing where my thinking took me. I started with the attempt to create simple statements that I hoped would lead me somewhere meaningful. I doubt what I know; it fluctuates. My relationship and understanding of my self and the world is subjective. I read (some of) Kant’s “Critique of Pure Reason” to be about the need to live as though the things that cannot be known can be (even while admitting that they can’t). There are some things which cannot be learned quickly and time, which is all we have, must be paid heavily for their acquiring. They are the very simplest things and because it takes a man’s life to know them the little new that each man gets from life is very costly and the only heritage he has to leave. Having come to some understanding of what I wanted to say, what I could stand behind as my beliefsabout knowledge at this stage, I then sought to ground these statements in the contexts of philosophy and epistemology. 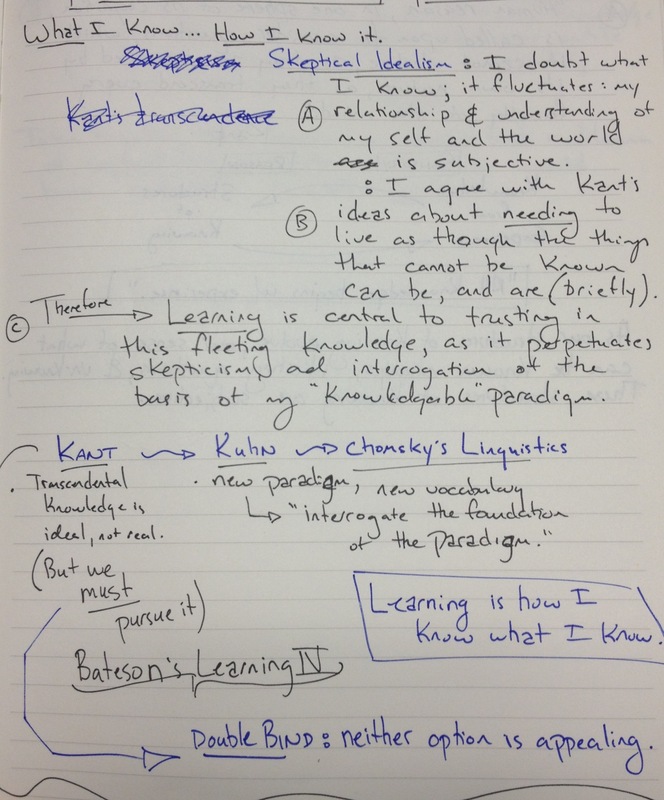 I had a few different ideas here, mostly due to recent thinking about Immanuel Kant, Thomas Kuhn, and Gregory Bateson. 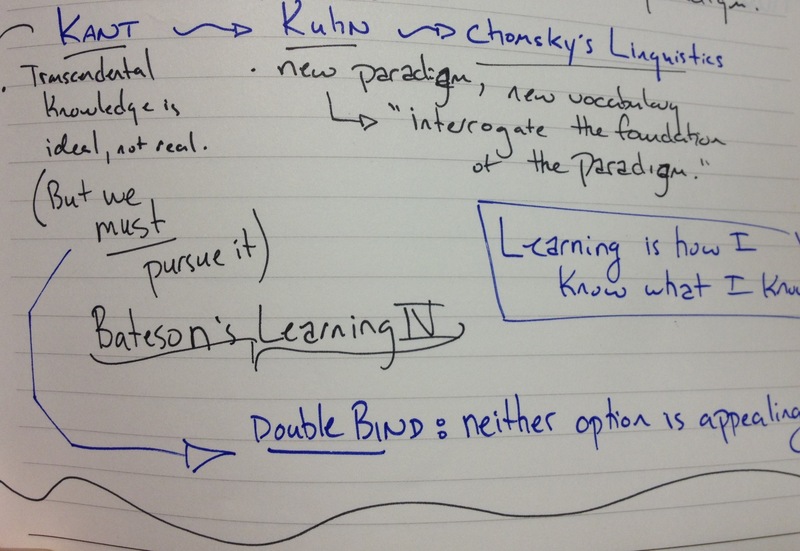 As it stands now, I’m returning to the syllogistic A & B –> C format of attempting to lay out my proposition about knowledge and learning, trying to hone the statements offered above and support them with some of the thinking of other philosopher’s. Taken together (A & B), this rationale – to seek, even when the knowledge may be beyond us – creates a dizzying cumulative effect that Gardner Campbell spoke about a few weeks ago in Vancouver: the double bind. I think this scenario is where I find my thinking aligning with Gregory Bateson‘s Hierarchies of Learning, and even the ‘scientific crisis’ written about by Thomas Kuhn, wherein the old paradigm is the prison, but also the route to salvation (for a time). But I’ll let you know how the next few steps go.